Forum Index > Historical Arms Talk > How common were protective rondels on poleaxes? Posted: Tue 09 Apr, 2019 4:45 am Post subject: How common were protective rondels on poleaxes? I think everyone here is probably familiar with that famous Wallace Collection poleaxe, A926. Hammer/spike/axe on the head, trailing into four langets, all terminating at a protective disc partway down the haft. I haven't had the luxury of perusing museum archives to know how common this feature was, but it seems to be relatively uncommon on modern reproductions. Do any experienced scholars here know roughly how common these rondels were? Were they largely confined to particular regions or time periods? Posted: Tue 09 Apr, 2019 4:40 pm Post subject: Re: How common were protective rondels on poleaxes? The late 15th-century version of Schilling's chronicle you often find them with the roundel, a lot of artistic evidence I know does show it, actually. I believe it would be more profitable to find historical pieces and artistic evidence for pollaxes WITHOUT the roundels to get the idea of how uncommon the absence of protective rondels were. Considering they were a weapon for the class of men-at-arms and up, it doesn't seen unthinkable of them to have a more expensive protection like this. You'll note that with the exception of one image, from BL Harley 2278 Lives of Saints Edmund and Fremund, there are no instances of poleaxes with any sort of rondel during the first half of the 15th century. So they seem to be rare indeed, at least at this point in time. 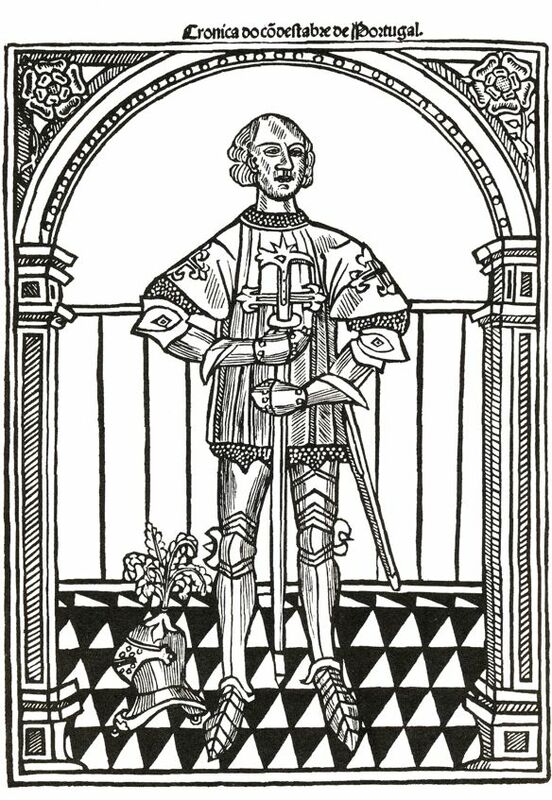 You can also find rondels on this pollaxe https://collections.royalarmouries.org/object/rac-object-1261.html and a number of other surviving examples. I would not draw any broad conclusions from the survey above because as was said this is only the first half of the 15th century, and there are a number of depictions of rondels in the second half of the century as well as at least one from the first half, as well as the surviving examples. It is possible indeed probable that rondels became more common over the course of the 15th century. https://i.pinimg.com/564x/a4/94/0d/a4940d0536b8246aa268fa28e39de397.jpg - I believe this is one of the BNF Froissarts from the third quarter of the century. 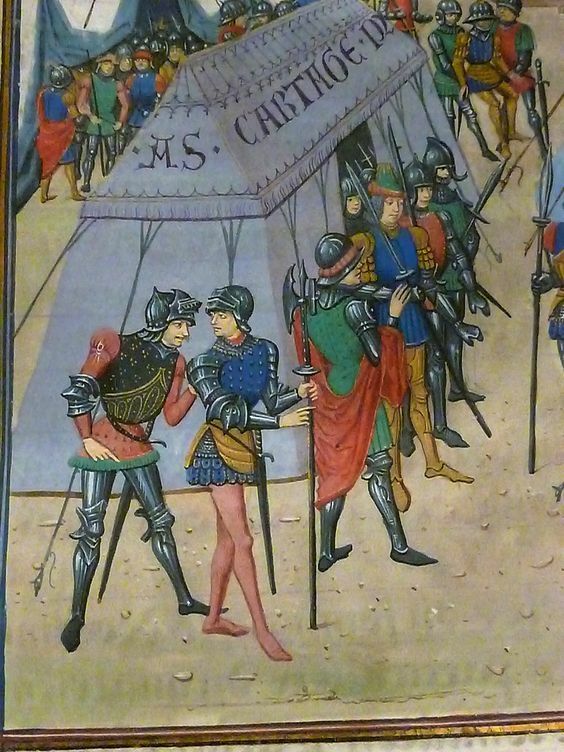 http://warfare.gq/15/Beauchamp_pageants-XXXVIII.htm - here's the Beauchamp Pageant from the 1480's. https://www.alamy.com/stock-photo-caesar-caius-julius-137100-15344-bc-roman-politician-dictator-49-and-111512899.html - this is one of the Caesar tapestries from the 1460's or 1470's, captured by the Swiss from Charles the Bold and now in Bern.